I will start by sharing a passage from a Neapolitan song that has been in Spacca Napoli’s window, alongside a drawing of Toto, since we opened on Valentine’s Day, 2006. I met this girl and I fell in love. I bought her a 15-karat diamond, but she refused it. She wanted a pizza, I took her to one of the best restaurants; a place where you eat while the sea sings. I ordered a beautiful grilled fish, but she wanted a pizza. I finally married her and at the wedding I ordered a five-layer cake. But she wanted a pizza with just tomatoes on top. So finally, I decided if that’s all she wants, that’s what she is going to get! I love when I see someone pass by the pizzeria, stop for a moment to read the words, then smile. Something so simple, a pizza, can give so much pleasure. These words express something essential, how food and love and culture, poetry and art are all intertwined. This was our experience living in Italy. When we returned to the states, I longed for it. I consider myself more than fortunate; my trips to Italy today are frequent. I am able to engage in a continuous cycle of study and research, making new discoveries and contacts, always aspiring to a more profound understanding of all that I experience and to incorporate it into our work and culture at Spacca Napoli in Chicago. It is through pizza, la pizza, that I have been able to express my deep love for Italy, the Italian culture of food, family and community, and all the ways that it is connected. I found my calling as a pizza maker–or, should I say, it found me–when I was fifty years of age. To say that there has been kismet and synchronicity in the journey which spans almost 30 years, and which has led me here today, would be an understatement. I would not be here with you today if it were not for the years I spent in Florence and the Gargano in Puglia in my thirties, so first I will share some of that background, as it forms the heart of what I do today. We arrived in Florence the fall of 1988. The “we” is my family: my wife Ginny Sykes and our daughter Sarah Rose. I was thirty-three, (“come Jesu,” as I often heard said). Ginny, an artist, studied painting while I cared for our daughter Sarah who was 20 months old when we started this journey. I was a Fiorentino casalingo, as well as un straniero, that is, a house husband from somewhere far away and definitely, definitely not Italian. I had left my profession as a clinical social worker for this exciting new chapter. We lived in the Oltrano, a neighborhood across the Arno river from the Duomo, surrounded by artisans carving violins, cobbling shoes, working with leather, restoring centuries old furniture and building cornice–with tools hanging on the walls of their shops same as they had been for four and five generations. What could be better than a life in Florence? I took daily runs in the Giardino Boboli, did morning shops at the mercato centrale. This always included a visit to a favorite alimentari so Sarah could choose her morning snack for the Asilo Nido; a panino with prosciutto cotto, mai (never) crudo, or a nice piece of sciacciata. To this day, Sarah still pulls the fat off a piece of crudo; something, I will never understand!! Well, as they say, “De Gustibus Non Disputandum Est”; taste is not to be disputed. Our fridge was tiny, just a few cubic feet: think college dorm room. When I shopped each day, I often took inspiration and guidance from my aunt Joyce Goldstein’s cookbook, The Mediterranean Kitchen. Joyce was a front-runner of the California Food movement alongside Alice Waters of Chez Panisse. Joyce’s restaurant, Square One, in San Francisco, was legendary; the name conveyed the idea of going back to square one every day, to use market fresh ingredients, and to work directly with farmers. Back then in the US, this was a new concept. Joyce’s approach truly helped shape my understanding of working with seasonal fare, and choosing the best and freshest of available ingredients. This guided my daily marketing in Florence. I continue to respect and celebrate this essential concept as a guiding principle of what we do at Spacca Napoli. A few of Joyce’s recipes I made: Trota allo Zenzero, Pescespada Ripieno alla Siciliana, Fusilli alla Napoletana, Umbrian meatballs the size of walnuts with molica, (soaked bread) and Suppli al Telefono. In the market were every kind of vendor; one could find pigeons and smaller birds, poultry, fish, meats such as cinghiale and bistecca fiorentina; all types of salumi, fresh pastas, cheeses, biscotti, fruits and greens. I had my favorite stalls; each visit provided an opportunity for a salutation, question, discussion or just a smile. Everyone had a favorite recipe or method to share; It was the same in the small neighborhood shops. The pescaria, the alimentari, latteria, macceleria or merceria all offered something particular. These locations, along with the cafes and barber shops, could be considered “un terzo posto”, a third place, between home and work, to engage in a simple or not so simple interaction; whether it be about the weather, food, politics, religion or la bell’arte. We returned to the same frescoed apartment, year after year, embraced as members of the community. With meager funds to cover our cost of living, any opportunity to barter was greatly welcomed. I became the janitor/maintenance guy (in lieu of tuition) where Ginny studied at the Atelier Cecil–Graves. We were treated like family, shared their traditions, their joys as well as their sorrows, and over the years, many, many recipes. These friendships continue today. 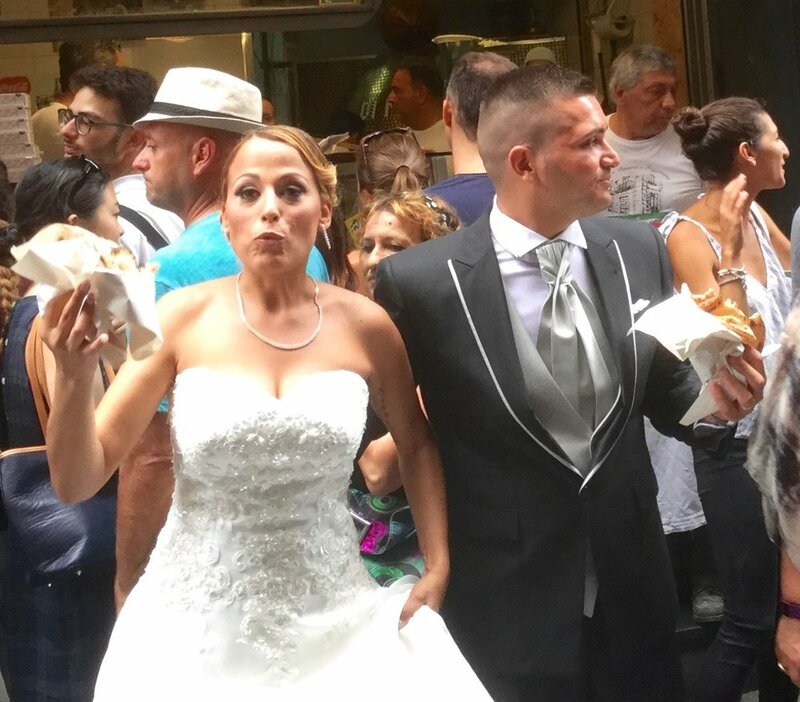 Outside of Florence, the richness of food and culture continued to be part of our experience. We attended our first sagra in Pruno, a village in the mountains, formerly of marmisti, (marble cutters) high above Massa Cararra and Stazemma. Sagras are cherished local festivals celebrating food, such as lamb, fava beans, potatoes, chestnuts, wild asparagus, artichokes, anchovies, tuna, swordfish, salumi, cheeses, wine, and are often accompanied by historical pageantry, music and dance. They are fundamental markers of time and tradition. 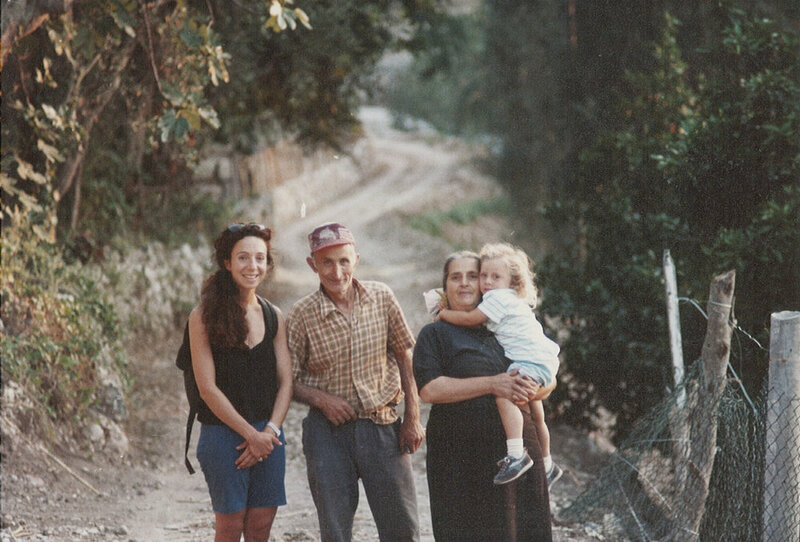 Picking olives every fall in the Tuscan hills, at the home of Folco Romanelli was a seasonal marker for our family. These Sundays included leisurely lunches with plenty of rustic wine. Artisanal sharing went beyond food and wine. One day Ginny came home very excited. There is a special study room at the Uffizi where one can copy old master drawings, accessible by special permission only. On this day a gentleman also studying there handed her a piece of paper and suggested she try it for her copy. The charcoal took to the paper in a manner she had never experienced before. The paper, from an Italian church registry was 300 years old. Our summers in Puglia in the Gargano took us deeper into the Mediterranean culture and lifestyle. Rodi Garganico is a fishing village, Grecian in architecture. The surrounding hills produced, in their heyday, lemons and oranges and other agrumi for the world market. The Ciampi family, of the Sorrento in Campania, had land there and won first prize for their lemons in Chicago’s World Fair in 1893. Our summers in Rodi provided a different experience than in Florence, more a la natura. My cycle was like that of the local contadini, following the rhythms of the sun and the rising of the moon. We still had our favorite baker, fish monger, and vendors of peaches, greens, cheeses, meats, salumi and poultry. When we had a taste for a very special focaccia ripieno, stuffed with anchovies, wild onions and raisins, I had to sneak by Lello, of our usual paneficio, to not be seen entering the door of the other baker. I worked as a bagnino our second summer in lieu of rent. Early every morning I opened beach umbrellas and made sure each family had their proper lettini and straglie. Then I would go into the village to buy Lello’s fresh hot svogliatelle and pane Pugliese for Ginny and Sarah, and join the fishermen at the American Bar to find out what they were drinking. Nothing like a good morning digestivo! In Rodi, we were embraced by this second community. We tasted delicious tomato sauces and were introduced to many local festivals. From the beach to the bagno were conversations of last night’s dinner, where to find the best caciocavallo, and what would be on the table today. I collected and practiced many recipes, from Calamari Ripieno, Lumache, Risotto, Carciofi alla Romana, Minestra di Pesce and Razza. These kinds of memories form the core of what we try to offer in Chicago. We returned to the states in 1991, but we could not stay away from Italy, and we spent more summers in the Gargano. In 2003 I met my guardian angel, a young Italian, on a flight to Rome. As we chatted, Ginny handed me that day’s newspaper (remember those days?) inside of which was a photo of her and me cooking a meal for the Inspiration Café; an organization that serves the homeless in Chicago. It was a surprise to see it and I showed him the picture. Upon seeing me cooking, he casually suggested I open a pizzeria; that with flour, water, salt and yeast, I could make a lot of money. It was as if he could see something in me I did not yet see. Here, Cupid shot his arrow through my heart. I had been thinking this might be our last summer in Italy for sometime. Instead, this chance encounter with a stranger opened the door to the world of pizza, as if it was waiting for me to enter all along. Even stranger still, this “angel” had told me he had a Neapolitan café in NYC’s Little Italy. I searched for it, but I never found the café nor saw him again. Friends in Puglia said if I were serious about this idea, I had to go to Naples. A walk through Spaccanapoli and Forcella was all I needed to feel the energy on the streets and in the pizzerias. I saw the joy, anima and excitement in people of all ages crowding around their favorite pizzerias waiting to get in. Thus began my love affair with pizza. I realized this would be my life’s work. In the daily dough making I would follow in the footsteps of the pizzaiuoli, artisans, bakers, chefs, contadini and fisherman. I would do something every day to make my work better and this would give my life meaning. My food experience up until this point included teenage summers in a hotel kitchen in the Catskills, a little table waiting, and my volunteer cooking at the Inspiration Café. Everyone, including Ginny, thought I was a little pazzo with my new idea. Pizza napoletana, in a city known for its deep-dish? I would tell various people that I was going to open a Neapolitan pizzeria; they would smile and say, “that’s nice”. I knew what they were thinking. No matter, I was on my way. Over a period of 18 months, I spent ten months in Naples. I walked the streets of Spaccanapoli, seeing as many pizzerie as possible. The summer after the plane encounter I learned of one of Napoli’s great masters, Enzo Coccia. Four months later, in November 2004, I was studying with Enzo at his pizzeria, La Notizia. I ran around Naples with flour in my hair, dried dough under my nails, and a Molino caputo shirt as my uniform. My study with Enzo provided an understanding of what I would need to learn over the many years to come. One does not learn how to make a pizza overnight. That to become a pizzaiuolo takes a lifetime. With observations, questions, guidance, and practice, one slowly begins to master the making of dough, extending and topping the pizza, and baking it in the oven. Encouraged by Tony Mantuano (of Chicago’s renowned Spiaggia Restaurant, I brought over the Agliarulos, a fourth and fifth generation family of oven builders from Naples. I had met them through my friends at Pizzeria DiMatteo. I also brought over a particular mixer, un braccio tuffante like DiMatteo’s. The arms of the mixer have a diving motion similar to that of a baker or pizzamaker reaching into and mixing the dough. The oven and the mixer are the two most important pieces of equipment at Spacca. I return to Italy about every two to three months, because there is always more to learn; I am thirsty for it, even though I often don’t know what will happen until I am there. I feel I am part of a pizza guild­–similar to the guilds of the Renaissance–dedicated to my daily craft. One enters a guild as an adolescent or young adult and remains a lifetime. I have only been at this 13 years. Many pizzerias, with their varying methods and practices were so willing to open their arms and their hearts to me: Trianon, Di Matteo, Da Michele, Antonio Starita, Adolfo Marletta, Franco Pepe, Attilio Bachetti and Ciro Oliva are just a few. These are my new families. Their generosity of spirit is crucial not only to my personal growth, but the growth of the guild. In the beginning, I studied the movements of hands, sketched the pizza banks, oven layouts, and pored over menus. (I did eat a few pizzas.) I have developed relationships with many pizza makers. I love spending a day at a locale, enjoying its unique culture, asking questions, observing. Sometimes I am in their dough rooms and by their pizza banks. As I evolve within this guild, this “misteri”, not only do I learn more about flour, the dough making process and the making of pizza–my understanding of wine, mozzarella, olive oil, agrumi and Neapolitan culture also continues to grow. And so much thanks is due to my good friend, Domenico Mazzella, whom I learned of seven years ago at the table of the Baronessa Cecililia Bellelli Baratta at Tenuta Seliano, a farm and agri-turismo, in Paestum. Arthur Schwartz, a well-known New York culinary personality and author of Naples At Table happened to be there that day. A friend and colleague of both my Aunt Joyce and the Baronessa, Arthur recommended we stay at Domenico’s B&B Donna Regina in the centro storico of Naples. More synchronicity. Domenico is a Renaissance man, and we share an appetite for research and sourcing the best and most interesting wines, cheeses, fagioli, anchovies and more. We travel hard, always in the service of la pizza. 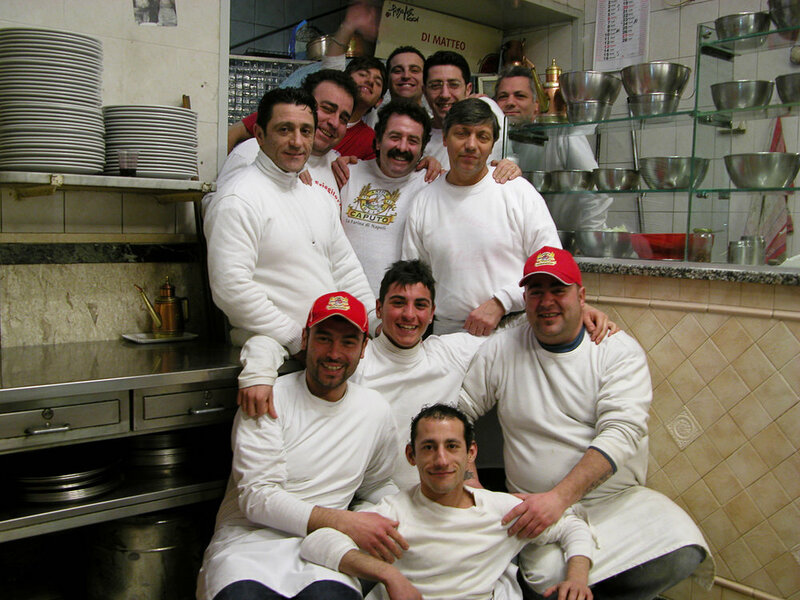 Domenico has written a marvelous local guide for Naples, le via delle pizza. To conclude, my passion for Italy has taken me into this other dimension: the world of pizza. Italy is truly part of me, so is pizza. When asked about my heritage, I usually say “sangue russo, piedi americani, ma, cuore Italiano”. Russian blood, American feet, Italian heart. I am no longer thirty-three years of age, “come Jesu”, I am 63. Nevertheless, an analogy to Jesus may still have relevance, not only for me but for all of us here today. When we are one with our pizza, it is part of us and we are part of it: soul, spirit, anima. When we share our pizza, we share ourselves. What happens at the table with guests has as much meaning to me as the time I spend in the dough room, whether in the quiet of the early morning or late at night. As important, is the time I spend with vendors and staff. This is a trinity, if you will, rooted in passion. I am a lucky man. To be able to live this dream, to feel such passion every day, to see people happy, to watch our neighborhood families grow, and to have a little community corner in Chicago that pulses with life. My mission is to share this joy, my craft, knowledge and understanding with the Chicago community, and with pizzaiuoli around the world. I learned this in Naples, where there is a pizzeria on almost every corner: there is enough room for everyone. When I think about it this way, it becomes work that can nourish body, spirit, mind and soul for a lifetime. Pizza for presentation at LSDM.